Some airports are more well-equipped for weary travelers than others. Sleeping in an airport is never the ideal situation, but these things happen and there's not much you can do to make it better. Screaming kids, plastic chairs from the '70s, those little glof cart thingees that go whizzing by: none of these are conducive to restful slumber. A new poll of its readers by Budget Traveller rates the best and worst airports to bed down in. The mag plays it a bit heavy-handed saying the tips might be for those "really on a budget," but we've all been there. The thing to do is to go abroad. The top three best are Singapore Changi, SeoulIncheon, and Amsterdam Schiphol (stoned travelers will call almost anything a good place to sleep; please note that this airport also houses a casino). And the worst -- and here is where we move stateside -- Paris Charles de Gaulle, Moscow Sheremetyevo, and New York JFK. New Yorkers are hardly surprised. Most don't even rate their apartments very good places to sleep. 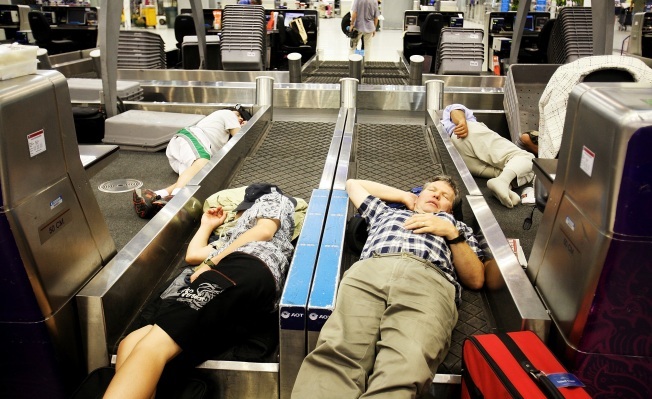 LA and Chicago O'hare also made the top 10 worst airports to sleep. Denver was the sole representative from the U.S. on the best place to sleep. And this is a mixed blessing. A commenter on sleepinginairports.com says of Denver: "No noise except ...whispers of shocked passenger talking about the group of thirty or so well dressed and equipped, but seemingly homeless people lying on the couches." This gives you some indication of why JFK being on the worst list is probably a good thing.